We only stayed one night and didn’t get to use any amenity but I have to pay anyway. Overall our stay was excellent with a great ocean view. The hotel shopping area was also very convenient. The Spa area and service was also very satisfying. Great location with easy access to the beach and shops! Also, the infinity pool was amazing. Rooms are just ok and really need updating, but everything is clean. It's a nice hotel at a reasonable rate in Waikiki. Nice Hotel. Conveniently located to beach and shopping. ants in the room and the bathroom sink would not drain. Centrally located hotel right next to the beach. Liked the amenities as well! Beautiful hotel close to ocean and the pools are beautiful! Nice and convenient oceanfront hotel, also family friendly. Had great kid pools with water slide. It was crowded since we were there during summer vacation. Great location for beach access and shopping but the rooms need to be updated. Magical! Our vacation was a dream come true, and our hotel added to the amazing experience. Beautiful views. Amazing pool. Attentive staff. Had a great say the staff was awesome! Mahina was the best concierge ever, thank you all! I had a wonderful 4 night stay with my young niece and nephew at the beautiful Sheraton Wakiki. I would definitely recommend it and would consider staying their again on our next trip. A plus is that they have incorporated some great technology features. Upon check in you are issued a wrist band that you will wear throughout your stay -- and which also unlocks your door as well as identifies you as a guest at their beautiful pool area. Many of their rooms have a lovely balcony! We found the staff to be extremely courteous and helpful. Although the concierge seemed a bit overwhelmed and was somewhat short with us. The hotel views are amazing and you are steps away from the beach. They have a lovely pool area for families but it can tend to get a bit crowded. If you wish to get a lounge chair -- you do have to go down when the pool opens at 8 a.m. to start your day. Otherwise it may sometimes be hard to find a chair later on. I would recommend paying the extra fee to reserve a lounge chair or cabana so you don't have to worry. The pool area is beautiful -- though it seems a tad smaller than you would imagine from the photos. There is one pool for families and one infinity pool for those over 18. The only one disturbing occurrence was an occurrence in the family pool which bothered my young nephew -- when a couple kept "making out" continually in the pool. I feel that they should have chosen the adult pool instead. The pool staff did nothing to stop them. Great staff and beautiful views. Highly recommend the ocean view with diamond head. Love the hotel but wish the rooms could be updated. Pool tile needs much attention. More food choices, lots of Asian food but not a lot of American choices. Rum Fire was closed for private events more than it was open. My resort fees were not adjusted for “things” I couldn’t use. 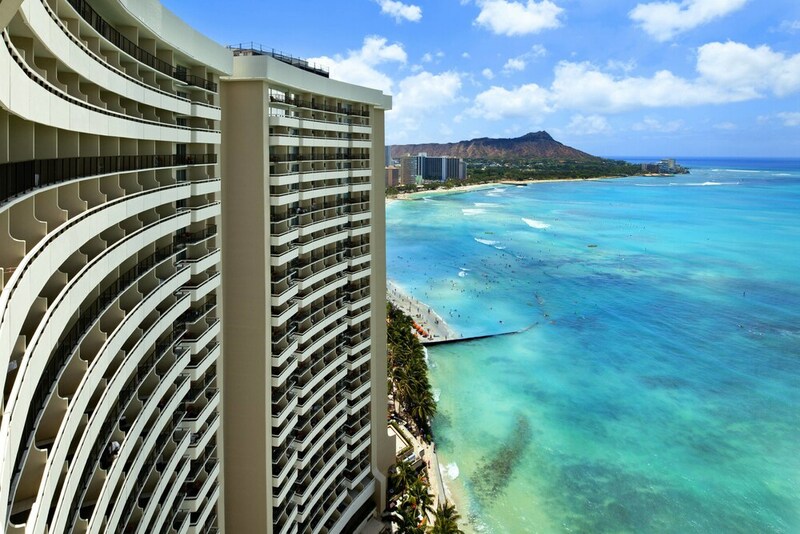 Located in Waikiki, Sheraton Waikiki is adjacent to Royal Hawaiian Center and within a 5-minute walk of other popular sights like Waikiki Beach Walk. This 1636-room, 4-star hotel has 2 outdoor pools along with a full-service spa and 5 restaurants. This hotel is home to 5 onsite restaurants, perfect for a quick bite to eat. Satisfy your hunger without leaving your room with room service, or quench your thirst with a beverage at the bar/lounge or coffee shop/café. Start your day off with buffet breakfast, available for a fee. Guests can expect WiFi and a flat-screen TV with pay movies and a video-game console. The pillowtop bed provides a full night's sleep and the bathroom offers hair dryers. Other standard amenities include a lanai, a refrigerator, and a coffee maker. Guests of Sheraton Waikiki have access to a full-service spa, 2 outdoor pools, and a children's pool. Parking is USD 35.00 per day (USD 45.00 per day for valet parking)—but if you prefer not to drive, catch a ride in the airport shuttle (available 24 hours) for USD 32.00 per person roundtrip. The front desk has multilingual staff on hand 24/7 to help with luggage storage, tours or tickets, and dry cleaning/laundry. Other amenities at this beach hotel include a health club, free WiFi in public areas, and a business center. Mahalo for taking the time to provide us with your feedback on your stay with Sheraton Waikiki! Aloha, Thank you for providing us with your feedback. We're sorry to hear that this was your experience during your time here with us. I do hope that our engineering team may have been able to assist you while you were here. Mahalo N. Flores! We're happy to know you enjoyed our convenient location oceanfront in Waikiki. Aloha! We truly appreciate the time you took to provide us with your feedback here on Expedia. We are happy to hear that overall you enjoyed your time with us and that honored to hear that you recommend our property. We look forward to the opportunity to welcome you back again soon! The hotel has 2 outdoor swimming pools and a children's pool. A waterslide and a health club are other recreation options. Guests under 18 years old are not allowed in the swimming pool. Guests are requested to provide their estimated arrival details in advance. Please contact the property using the information on the reservation confirmation received after booking.